All transactions are safe and secure with a reliable history in online purchasing behind each of our associates. 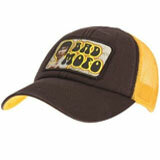 Buy the Bad Mofo Bruce Lee Hat to own Bruce Lee clothing and merchandise. Top off one of the bestselling Bruce Lee tees with this Bad Mofo hat that is pretty self-explanatory. The trucker style cap is perfect for fans of the legendary martial artist, who want everyone to know that like the Jeet Kune Do master, they are a bad mofo themselves. In addition to the Bad Mofo Bruce Lee Hat above, browse the Bruce Lee Clothing Gallery for more apparel like men's and women's clothes, kids shirts or hoodies.